So we’ve cooked our way through Ottolenghi books in recent years, swooned over the vibrant global flavours magicked by veggie-friendly recipe writers like Marlene Spieler, Louise Pickford and Jane Baxter, and have been dazzled by the genius of Vanilla Black. Is it time for a post-modernist revival of wholesome, wholegrain retro veggie food? Could nut cutlets now become trendy? And what would, say, Cranks and Country Life restaurants be like if they were to open today? 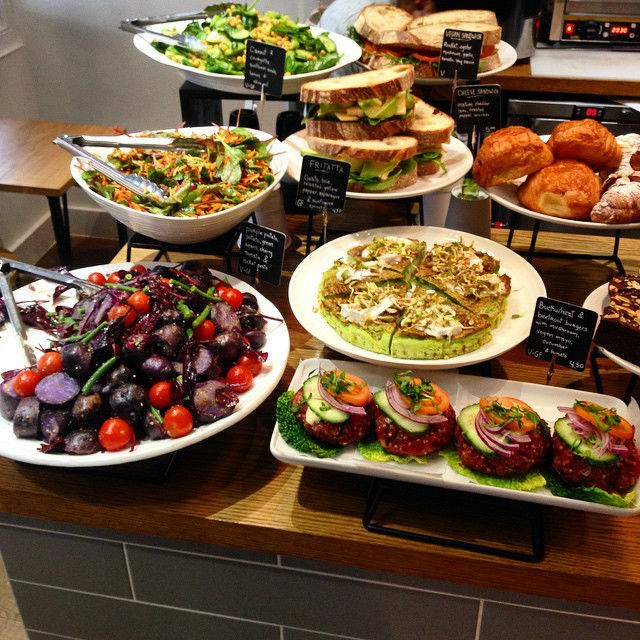 These are some of the choice morsels we chewed over during our lunch at this stylish little vegetarian café in Fitzrovia. Kin — presumably the name refers to Peter and Charlie Meadows, the father and son duo who own the place — quietly opened early last summer without fuss or fanfare. 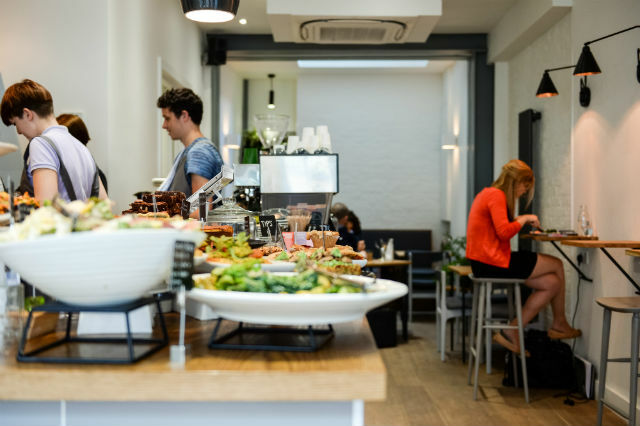 Tucked away in a side street behind Goodge Street station, past dozens of more look-at-me restaurants, it’s a small, unassuming daytime-only café. The cool, minimalist grey-and-cream interior has a counter at the front on which the food is attractively displayed. You have to queue and pay upfront; staff then heat up the dishes and bring them over. The daily-changing menu (announced on their Facebook, Twitter and Instagram pages) included, on our visit, frittata and burgers with a choice of three salads, leek and potato soup, mixed bean and sweet potato stew, sandwiches, cakes and pastries. A wedge of yellow pepper frittata topped with goats milk brie and sunflower seed sprouts is deliciously savoury and we could happily eat it all day — but we’re disappointed by the inclusion of out-of-season asparagus. Chunky, garnet-coloured beetroot and buckwheat burger, prettily presented on a crinkled savoy cabbage leaf and topped with sliced onions, tomatoes and cucumber, is substantial yet miraculously light and un-stodgy. It has a pleasantly nutty taste and somewhat chewy texture, made silky and slippery by the addition of sliced mushrooms. See, we told you it was old-school: what are frittata and burgers but quiche and nut cutlets in contemporary guises? Bright rainbow-hued salads are simply beautiful. There’s chunky purple potato with red baby lettuce leaves, green beans and cherry tomatoes with rocket pesto, and spinach, chickpea, celery and cucumber with avocado dressing. (The potato and chickpeas need slightly longer cooking time though.) There’s also grated carrot, beetroot, courgette and sunflower seed salad simply coated in lemon juice and olive oil. You can barely taste any of the dressings, but on the other hand their understated use makes the salads sprightly rather than soggy. Like in many vegetarian and healthy eating-type places, everything is under-seasoned and tastes austere and virtuous. There are no big flavours, but the food is big-hearted. The ingredients are sparklingly fresh and of high quality, sourced from environmentally-friendly, sustainable companies with a social conscience. Dishes are unpretentious and prepared with a lot of care, attention and an eye for visual appeal. Almost everything is cooked on-site, except for some of the cakes and pastries from Manna Bakery “because we don’t have a gluten-free kitchen”, explained a member of staff. Vegan and gluten-free dishes are clearly marked. A hefty but fluffy wedge of polenta, orange and almond cake — gluten-free, as it happens — is moist, crumbly and moreish. Topped with glazed almond flakes, it has a good, strong marmalade-y taste that we think comes from whole stewed oranges. They’re serious about their coffee, too; though we opted for freshly pressed broccoli, kale, apple and celery juice. Served in a small, reusable glass milk bottle with a straw, it packed a (healthy) punch with its distinctive vegetal, mineral flavour. Staff are sweet-natured — one is particularly chirpy and gregarious — but service can be a little shaky when it’s busy. We paid around £20-£25 including drinks and tip, but you can easily eat here for less than a tenner. Nut cutlets may never make a comeback, but beetroot and buckwheat burgers are here to stay. Yes, we’re keen on Kin. 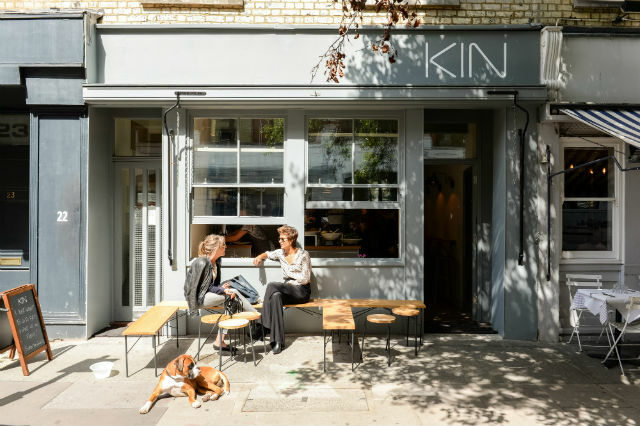 Kin, 22 Foley Street, W1W 6DT. Tel: 020 7998 4720. We review strictly anonymously and pay for all the food, drinks and service. Images supplied by the restaurant.